Cactus Pads, or “nopales” in Spanish, are the flat green leaves of the prickly pear cactus The cactus is native to Mexico, where it is still grown, and can now be found throughout the U.S. and the Mediterranean. Harvesting cactus pads can be challenging without the proper tools; heavy gloves are used for protection from the sharp spines, and a vegetable peeler or small pairing knife will do the trick. Wash the cactus pads with cool water, and peel or trim off any blemished or discolored areas. Slice them into long strips or dice into cubes and cook with other foods. Caution: overcooking cactus pads will take on a slimy taste and texture. Whole cactus pads can be grilled or roasted until tender and slightly browned. 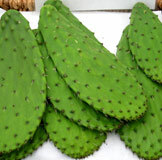 Most traditional recipes use cactus pads as a ingredient in soups, salads, and stews.